In August 1923, William Dana Reynolds, with his wife Vera Hunt Reynolds and their young daughter Helen embarked from Honolulu on the Japanese steamship Taiyo Maru, bound for Yokohama. 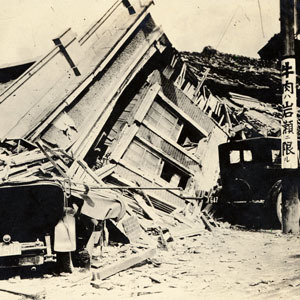 While at sea, the ship experienced and survived a tsunami only to arrive, badly damaged, in Yokohama Bay on September 8th as witness to the destruction caused by the Great Kanto Earthquake. Fully aware of the risks involved, eight of the male passengers decided to leave the ship and enter the city. Dana Reynolds was among them. For the next few hours, and later, upon his return several days after the initial quake, he recorded a series of compelling images of the horror and devastation. A makeshift barge, small ships, lots of debris along the river. Busy street with many people walking between shells of buildings, debris, and fallen telephone poles. Image of Yokohama Bay showing men at a barge navigating through the water. There are steamships and cranes in the background. Piles of wood in front of a one-story building. A man works in the background, and a girl walks quickly by in the foreground. Men clearing out debris and fallen electrical or telephone poles, supervised by two policemen. Standing lampposts in background. Debris, downed telephone lines and poles, and the remains some one-story houses and building frames. Perhaps the remains of a factory, with wires, wheels, and metallic objects visible. Debris, some standing buildings, and the remains of the Yokohama Specie Bank, also known as the Yokohama Shokin Bank. Waterlogged debris in harbor. Wooden debris, cranes, building frames in background. Small ships, bridge also visible. Published photograph showing cracks in the road. Along the river, a desolate scene of debris and fallen buildings. There are some standing buildings on the hillside in the background. Downed electrical poles, abandoned bicycles, men sorting through debris and bodies, tires and buildings in background. In the foreground stands the remains of a brick foundation or wall, downed lines and poles, circular and metallic vats. Downed electrical wires in front of building frames and rubble. Building frame and debris, brick and wooden elements. Fallen bridge over river, hillside in background. Cracks in tree-lined road, small building in the background. A neat stack of bricks amid the rubble, possibly indicative of reconstruction effort. People gathered by the river, bridge with sign, many men to the side, buildings in the area relatively intact, smoke in the background from fires. Perhaps a former refugee site devastated by fire, with burnt cars, tires, canisters, and pieces of debris. Makeshift shelter on train tracks with about 11 people, hillside in background. Debris and the remains of an evacuation site, or factory. There are many cans and barrels and flat slabs of wood. Remains of the Socony Service Station. The shells of three burnt-out cars. In front of ruins of Customs House building; 2 soldiers/policemen. Train tracks in the hills, brick foundations. Part of the city had been completely leveled, and individuals sift through piles of debris in the hopes of finding a lost loved-one. Men at work searching through the remains of a building. Men sift through the remains of a fallen building as a cart rushes by. There are two standing buildings or building frames next to it. Ruins, "U.S. Government Property" sign, old brick foundation. Buildings in the foreground flattened. Men standing on elevated area with buildings in background intact. Smoke from fires in background. Some buildings intact, poles still standing, fire in the background, perhaps a makeshift refugee area. Younger man in suit and hat, cracks in the road, soldiers/policemen walking in the background, downed electrical/telephone poles. Standing 3-4 story building, taken from a distance, stone foundation in the forefront. Frame of old building gutted by fire, blackened tree, standing telephone lines and something possibly written on poles. Published photograph of men standing among debris and bodies, building frames in background. A scene from the Nihombashi district after disaster struck. Three men, from the Taiyo Maru, standing in the middle of a road. Downed telephone/electrical poles, building frame in the background. Published photograph (number 18); bodies in shallow water, among debris. William Dana Reynolds standing among the ruins in Yokohama. Street with fallen telephone or public transportation wires, train tracks. Published photograph (number 45) showing collapsed building with burnt machinery in front. Published photograph, showing drowned bodies in front of the Yokohama Specie bank. Published photograph (number 28), showing cracks in the road, men in white working in the distance, debris. Published photograph. Bodies of prostitutes in harbor or river.